Making this elegant ornaments using quilling paper is very easy. The technique is perfect for creating customized earrings for yourself or jewelry and other gifts for your loved ones. Stylish, big, bold and beautiful, these earrings make you look stunning and gorgeous, all in one go. So let's start with the procedure. Two pearls for decorating rings. Two jump rings and ear hook. Make small circles by using orange strips in the center and black on the outer side. Gently press edge to get the teardrop shape. 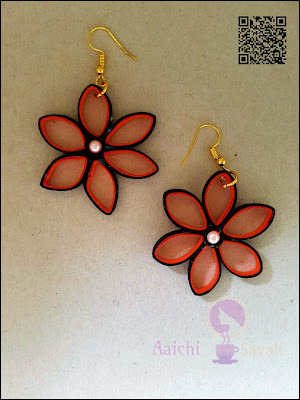 Make six petals for each earring and make two small circles out of orange and black paper. This is the center portion of flower earring and over the flower glue this to the center portion and make a flower. Over the center glue pearl (I have used white one) and Repeat the procedure and make another flower. Take jump rings and attach it to any of the petals, then attach the hook, close the jump ring. Voila! Elegant and decent earrings are ready. So try it and let us know how it came out for you.